Ray Hartman is an attractive, tall lilac with large dark green shiny leaves and large light to medium blue flowers on 6" spikes. It grows 15 to 20 ft tall with very straight erect flower heads. It is also a very fast grower. 'Ray Hartman' is very drought tolerant and is ok in heavy soils or sand. It is much more tolerant of garden conditions than its relative Ceanothus arboreus. 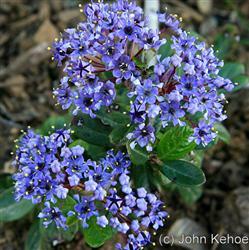 'Ray Hartman' is a hybrid of Ceanothus arboreus and Ceanothus griseus. It makes a fine garden specimen and can be pruned into a small tree.